IVF is no longer a tenuous, last ditch effort to be resorted to after all else has failed. We can now create a completely safe environment in the IVF laboratory for the eggs and embryos, removing any possible downside to IVF over attempts at conventional treatment with its low success rates. Petri dish set-up for IVF culture in microdroplets under perfect conditions that would ideally be found in your own fallopian tube and uterus. For example, a major improvement in embryo culture in our lab was realizing that the oxygen content in the air we breathe is much too high for eggs and embryos. In fact, most cells in the body are exposed to a much lower concentration than the air we breathe. Too much oxygen delivered to these cells can, in a sense, overheat the cell. So it is much better to culture the embryos in only 5% oxygen (not the 20% that is in air). This is difficult to do. Large amounts of pure nitrogen gas have to be blown constantly through the incubator at a carefully controlled rate to lower the oxygen concentration in the incubator. But it is worth that extra effort to get higher pregnancy rates. Classically, most IVF labs have cultured embryos at a pH (that means acidity) of 7.4 (the normal acid-base of your blood), and at an oxygen concentration of 20% (the same as in the air we breathe). However, these are not the acid or oxygen concentrations that are most favorable for embryo growth and development. In fact, the acid concentration inside the embryo is normally much greater than that, and the oxygen concentration is much lower. Conventional IVF culturing conditions, therefore, are too alkaline and too oxygen-rich. In fact, oxygen concentration in the fallopian tube is only about 8% (not 20% as in air), and in the uterus, it is as low as 2%. So we now know exactly what are the correct conditions in the IVF lab to perfectly mimic what would be present in the fallopian tubes and uterus of a fertile woman. We can safely culture your embryos to day 5 or 6 without fear of harm. This type of optimal culturing of embryos requires a lot of extra attention. To reduce the oxygen concentration in the incubator from 20% to 5% requires blowing through a huge amount of nitrogen (95%), and to keep the pH acid at 7.2 (but not too acid below 7.2), requires careful monitoring of the acidity of the media. This represent a lot of extra work, but it is well worth the effort. 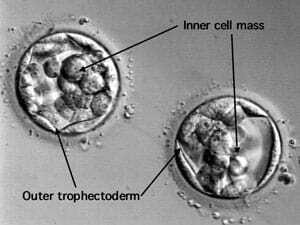 Embryos (blastocysts) cultured in vitro before transferring back to patient.